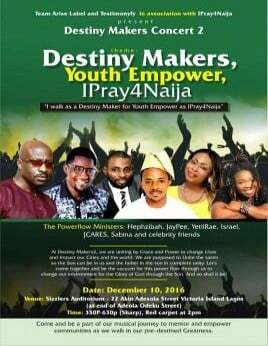 Arise label presents its second concert themed 'DESTINY MAKERS, YOUTH EMPOWER, I PRAY4NAIJA '. This would be a gathering of the youth and gospel music lovers, and prayers for this our darling country Nigeria. Come and be part of our musical journey to mentor and empower communities as we walk in our predestined greatness.